Historically, silicosis has been recognised as a dust disease affecting labourers from 40 to 50 years ago who worked closely with sandstone products. Unfortunately, this is no longer appears to be the case and many modern workers may be at risk. Silicosis is a permanent and aggressive lung disease caused by breathing in silica dust particles over an extended period of time. Silica is a common mineral found in everyday materials such as granite, sandstone, marble and slate. When an individual inhales silica dust, it becomes trapped in the lungs. Over time, the affected lung tissue scars and develops fibrotic nodules, impairing the sufferer’s ability to breathe. Unfortunately, there has been a noted resurgence of cases of silicosis across Australia, and this has been attributed to a seemingly innocent source – the growing popularity of home renovations. Reconstituted or ‘engineered’ stone products are highly sought after for modern kitchens and bathrooms due to their low price point and high durability. Unfortunately, these products contain high levels of crystalline silica, which, when manufactured, polished or installed, expose modern workers to dangerous levels of silica dust. Are you at risk of developing silicosis? 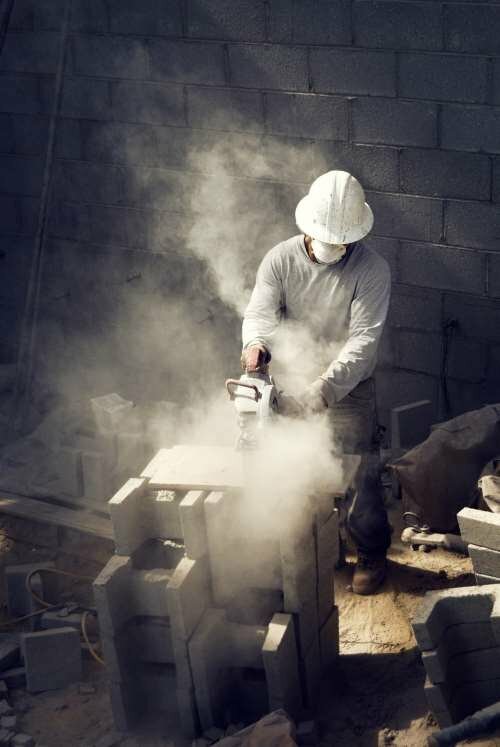 If you work with stone benches, or in any other industry that exposes you to materials containing silica, you may be at risk of developing silicosis. Silicosis is preventable, so it is imperative that your workplace educates you on the dangers of silicosis and provides appropriate protective measures to all employees at risk. Your employer should also arrange regular medical check-ups for all employees working with reconstituted stone products to ensure symptoms are detected as early as possible. If you believe you may have been exposed to silica, have been diagnosed with silicosis, or simply want more information, contact Shine Lawyers today. Our team of dust disease specialists can assess your circumstances and provide you with obligation-free advice about any potential entitlements to compensation. Written by Shine Lawyers on July 4, 2017. Last modified: April 16, 2019.